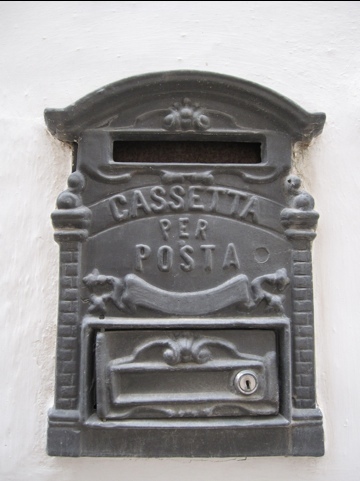 Posted by Wynette: When I was studying Italian before the trip I learned that “mailbox” is “cassetta delle lettere” which means, literally, “little house of the letters”. I’ve seen several variations of this since we’ve been here. Wednesday when we were in Cisternino I saw this one which says “little house for mail”. This is on the front of someone’s house in the old town. Italy 2011 Create a free website or blog at WordPress.com.